FonoTools offers amplification, delayed auditory feedback (DAF), masking, pitch change, loop playback and metronomic pacing. Such versatility of features enables the product to be used with many communication and learning problems, both diagnostically and in therapy/teaching situations. 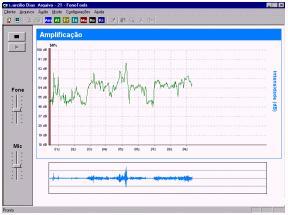 FonoTools allows unlimited sound recording and playback. The process begins from the clients microphone, passing through FonoTools, with all audio output ending in the headphones. Real-Time amplification often plays a critical role in accent reduction, improvement in speech clarity and voice improvement for actors, announcers, or teachers. This function increases or decreases the pitch of the client/s voice. This strategy is useful to work with dysphonia, hearing impairment, auditory processing training, falsetto and patients with Reinke/s edema. 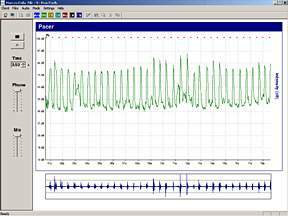 Delayed Auditory Feedback is provided to the patient as she/he is speaking, which seems to destroy normal real-time auditory monitoring while one is speaking. DAF has had long usage in facilitating better speech and voice in motor-speech disorders, stutters, professional voices and speech disfluency. Speech Range Masking provides a noise that produces an increase on the one's vocal intensity (Lombard effect). This function can be applied to patients with dysarthria, stuttering, or voice problems. Occasional aphasic patients seem to have a higher response rate under conditions of masking. Accent reduction and general speech-voice improvement is sometimes facilitated under masking conditions when the patients old speaking pattern can no longer be heard. 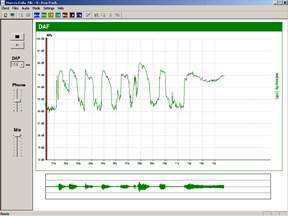 Playback You can use the loop feedback to provide the patient with immediate feedback of what was just said. Immediate auditory feedback via looping can be used to children and adults with learning and communication deficits, auditory processing disorders, as well as practical utilization in accent reduction and speech-voice improvement. This mode consists of a pre-defined number of clicks per minute, which can be set by the clinician. A metronome has been found helpful in establishing an optimum speaking rate in some dysarthric and stuttering patients. Besides that can be used in accent reduction (establish the prosody patterns of a new language), to auditory processing, to improve attention, and to help normal speakers become better speakers.